Red legs in Soho. : Graduation..Butler's Wharf Chophouse. Very bitty week for me. The big event was my Graduation ceremony. Without wishing to sound flash it is my third so I know the general idea. As usual there was the scrum to pick up gowns and mortar boards from Ede and Ravenscroft. These were supposedly made of 'deluxe' polyester and were, up close, very shabby. Academic gowns are both uncomfortable and for most women profoundly unflattering. My previous educational establishment sought to alleviate this by making us monastically monochrome and had no truck with squares on heads. Indeed squares on heads do not enhance most faces. I had a photograph taken by the professional photographer, the result made me look very fat (even in a black cloak) and she had coaxed a facial expression out of me that expressed nothing more than a bad case of constipation. The pictures taken of me by the bearded one were better although in several of those I have a lamp post coming out of my head! Do I have tips on wearing a gown? yes. They look stupid with cocktail dresses, a shirt with buttons is essential and high heels are a good idea (full marks to my friend Helen who wore a lovely bright red pair). Oh, and academic bods, walking through a beautiful building in a formal procession: I know you are terribly important but IRON your gowns! But a fun day and a big "congratulations!" to my fellow graduands. 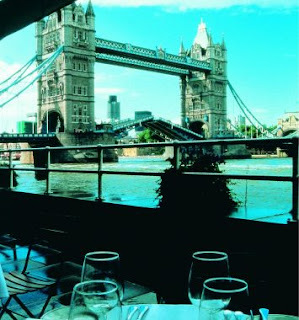 After the event we had lunch at the Butlers Wharf Chop House. Not a new restaurant, but I feel it is too easy to get caught up in the endless new openings on the London restaurant scene. 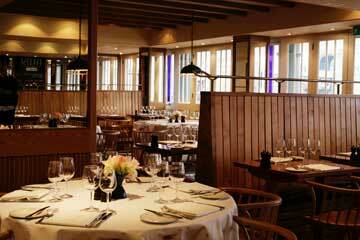 They in fact have a very good value lunch, 3 courses for £26.00 which for the location and the food is a steal. Sadly the sun had gone in by the time we arrived but on a sunny day there a very few restaurants in London that can compete with it for views. 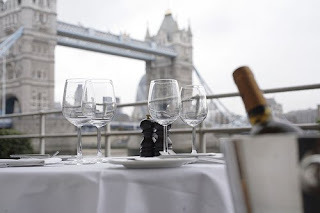 Straight out across the Thames and right in front of the enduringly pretty Tower Bridge. It is the perfect place to bring parents visiting from the sticks. The Chop House's schtick is British food, an ex Conran eatery this is naturally presented through the lense of Sunday Supplement food design. Condiments and sauces are served in those little twee preserve jars and our asparagus was placed on a completely erroneous piece of paper, on a wooden platter. The family matriarch pointed out rather tartly that good old fashioned china would have been more elegant and functional. The food however was pretty good. The asparagus and oysters consumed as a starter were excellent, the meat dishes, as you should expect from a chop house were tasty and the desserts which included Yorkshire Rhubarb and ginger ice cream were tasty. In fact tastiness and decent proportions were the most obvious components of the meal. The bread that arrived with the starter and continued to be offered was excellent and the one bit of unripe rhubarb was promptly replaced. It is worth pointing out a fit for purpose wine list. These can be rarer than hens teeth. This list was well chosen, our white, a Chilean Chardonnay I think, was lovely and slipped down our thirsty throats a little too easily. In short the lunch was extremely good value and the view hard to beat. Chop House balcony with view of bridge. Did I say it had a nice view?